Fun? What is fun? Perhaps all people do not view fun the same way. But, most people consider games fun. And, most people consider music fun. I've always found playing the music business game to be fun. For much of my life, the industry was untouchable to most people. The "corporate suits" had a monopoly over the supply chain. You had to get signed to a label in order to get distribution. The process of getting signed amounted to enslavement. Cost was another limiting factor for most people. To rent studio time or buy your own equipment was cost prohibitive. In the 1990's, things really started to change. I helped write and distribute some of the first albums made for the world wide web. Shortly thereafter, the MP3 became available to the masses for free. It became possible for a poor fool, such as myself, to make high fidelity recordings and distribute them all over the world... for next to nothing. Now, it is possible to do it on a much higher level of multimedia that includes photos, moving pictures and interactive gaming. For a while, I invented ways to do this using primitive tools that I created. The rest of the world was also doing their fare share of creating. Low and behold, along come games like Guitar Hero and Rock Band. Though at first I was a skeptical musician, I quickly became a convert. 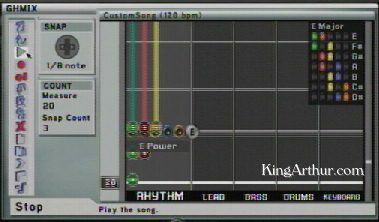 Just when I thought it couldn't get any sweeter, Guitar Hero incorporates a multi-track recording studio into the game. So, anyone... anywhere... that already plays video games can get a free hi-fi recording set up included with the game. You can write and record original music then publish it as a game song for the rest of the world to play! That is how this music was engineered and produced. That's what these songs are about.